When I was still pregnant with Isha I was able to check them out in the department stores and was simply amazed to learn that with your every purchase of their item you are also helping and supporting their Save the World campaign. Last May 21, Tiny Buds™ celebrated a milestone as it opened it’s first ever mall location in Glorietta 3. The pop up store serves as a home for all the natural items from like skin care, bath essentials, toothgels and home cleaners. It will be open until Feb 2018. The Pop Up Store is a place where parents can have an engaging experience every time they visit. Customers can try each item, learn about the benefits and even have their orders delivered to their homes for free! However the most noteworthy feature of the Pop Up is that, though it is tiny in size it aims to make a big impact on the environment. As part of the Tiny Buds™ can Save the World campaign which started on the website www.tinybudsbaby.com, Tiny Buds™ pledges to donate a portion of all proceeds from the Pop Up Store & the website to support WWF’s Environmental Conservation Programs. Each time a customer purchases an item on www.tinybudsbaby.com there is a corresponding number of Tiny Bus points donated. Every month, the points on the site represent how big the donation will be. This is how each Tiny Bud can save the world. 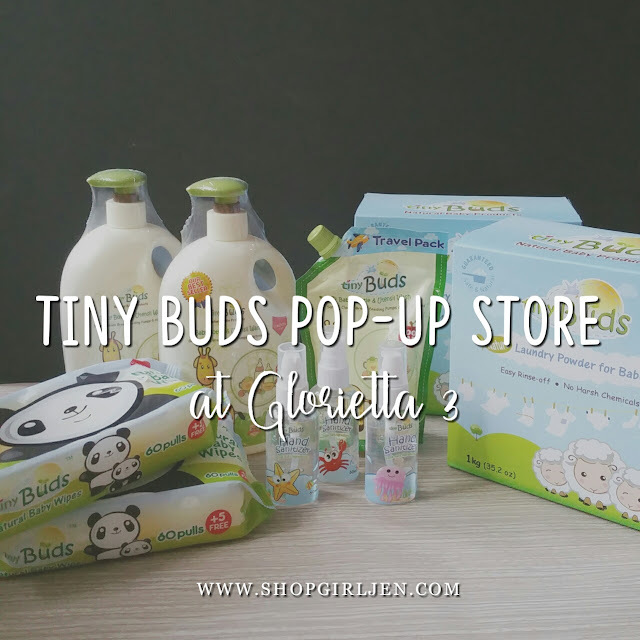 The Tiny Buds Pop Up store located inside POP by Retail Lab on the 2nd Floor of Glorietta Mall 3, it will be open until Feb 2018. Tiny Buds™ items can also be found in Baby Company, Robinsons, Mercury Drug, Rustans, Landmark, Savemore, Waltermart, Lazada, Shopee and more.